The inspirational humanist director John G. Avildsen (“Karate Kid”, Save the Tiger”, “The Power of One”) directs and opens with Rocky Balboa fighting a small-time boxing match, with barely a hundred people in the audience. The fight is even until he’s headbutted by his opponent which sends Rocky into an impassioned frenzy and knocking his opponent out. After the fight Rocky is paid a measly $40 for the victory. Rocky lives in a working class area of Philadelphia. He’s a neighbourhood guy, who also works for a local bookie collecting on debts. Rocky does this to make ends meet, as he says, “since he can’t sing and can’t dance, there’s not much else he can do”. But Rocky’s not even good at collecting debt. He’s supposed to break a guy’s thumbs if he can’t pay up, but instead lets him go scott free. The only thing Rocky can do right is box. Rocky’s given a chance at glory with reigning champ, Apollo Creed (Carl Weathers) who’s in town to grant an unknown local fighter a chance at the title for publicity purposes. Creed chooses Rocky because he’s white and that his nickname, the Italian Stallion, would sound good on the marquee. Of course, Rocky is completely underestimated by the cocky showboating Creed. Rocky reluctantly employs the help of veteran manager Mickey (Burgess Meredith) to train him into shape. Rocky is initially hesitant since it was Mickey who hasn’t shown him the respect he thinks he deserves. But the two convalesce and Mickey proceeds to train Rocky the old-fashioned way, lots of running, one-armed pushups and a slab of meat. Despite the opportunities for emotion in the ring Avildsen and Stallone find the heart of the picture in Stallone’s desperate attempts to court local pet store cashier, Adrian (Talia Shire). Adrian is a shy awkward wallflower. She’s a tough catch, and perhaps it’s the challenge that he’s attracted to. His perseverance to get his first kiss from her is impressive. On Thanksgiving they go on their first date, he bribes a local ice rink owner to stay open late so they can have a romantic skate, then he convinces her to come into his apartment. Rocky, a simple man, gains her reluctant trust with the utmost sincerity and honesty. When the fight happens it’s less about who wins and it is about Rocky's need to prove to Adrian that he can provide a decent life for her. Of course, the fight lasts more than the 3 rounds predicted by Creed, and he’s not the pushover he’s expecting. 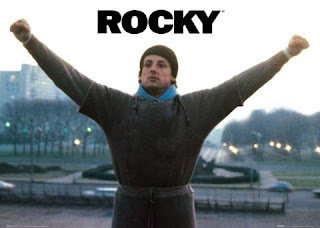 The ending isn’t the grand victorious triumph that parts II, III, IV etc drive towards, the climax isn’t a miraculous knock out, but Rocky’s recovery to continue after a brutal 15 rounds. He’s more George Chuvalo than Buster Douglas.